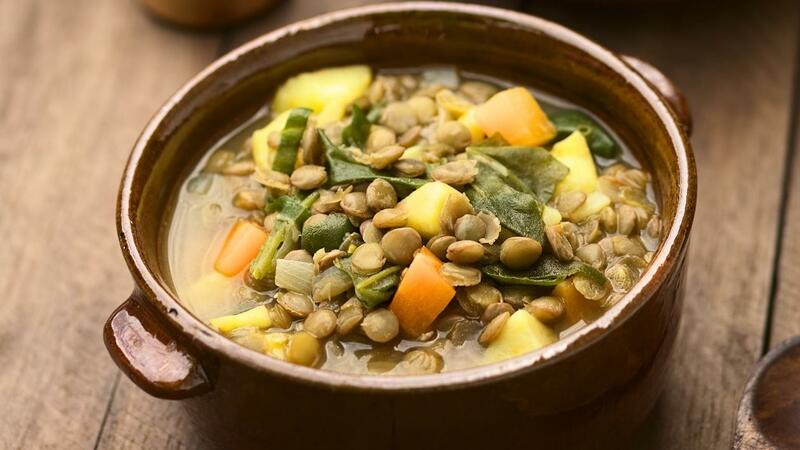 This Lebanese version of traditional lentil soup with spinach is seasoned with mint and lemon juice. It's traditionally served with toasted French bread for dipping. Heat corn oil in a large non-stick saucepan. Add onion and cook for 2 minutes. Add minced lamb and fry for 4 minutes or until brown colour. Add spinach, potato, carrot, and lentil, add cumin powder. Stir for 3 minutes then add water and Knorr Chicken Bouillon Powder. Bring to boil, stirring then simmer for 10–15 minutes or until vegetables are cooked. Add Knorr Lime Seasoning juice, stir and serve.